A lot has happened in the West End in 2017! Here's a round up of our year in events! Pulling us out of a Baltic winter, the Spring Celebration was a colourful celebration complete with stilt walkers, face painters and spring shopping bargains. In May Byres Road Fashion was held with the fabulously vintage Hillhead Library providing a stylish backdrop for local businesses to show collections from Byres Road and the lanes. Local stores Shelter, Just For You, Oxfam, Fat Face, Cancer Research, Jasmine, Nancy Smillie, British Heart Foundation, British Red Cross, Starry Starry Night and By Distinction Art debuted Summer collections. Attendees on both evenings sipped prosecco and listened to the vocal stylings of Richy Lee Graham during the sartorial displays of the businesses from Byres Road and the lanes. You may have spotted our wee Summer Shuttle bus which ran during July & August, affectionally known as the West End Wagon (to us anyway). We shuttled locals and visitors between Byres Road, KG Museum and Riverside museum, a cultural shopping experience you could say! Our fab and not to mention friendly street team were on hand to give advice and West End Maps to those taking advantage of the free service. Vinicombe Street could have been mistaken for a grassy knoll down south (well if you squinted and had a wee wine) The area transformed into a Village Green seating area with deckchairs, beach balls and garden games. Typical of the Scottish weather sometimes it rained on our parade! When it was sunny the area was packed with lunching locals and wee ones enjoying the pop-up entertainment that graced the green from time to time. Bill in the Botanics arrived at the Glasgow Botanic Gardens for four nights late in an unusually rainy August! BITB was an outdoor cinema celebration of the movies of Scottish director Bill Forsyth. The downpour was not enough to put off the many hundreds of hardy Glaswegians who joined us throughout the four nights come rain or shine. 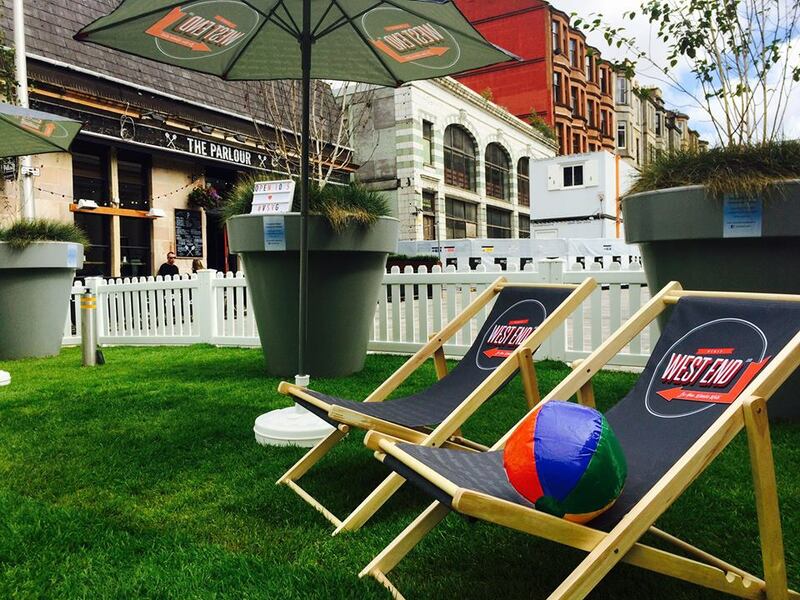 The second Byres Road Book Festival took place 22-25 September with partners Waterstones, Oxfam and Glasgow Life. The four day event featured comedy, the morose, the magical and the mysterious from over 20 authors, poets and illustrators. Christmas On Byres Road is a fantastically festive time for locals and visitors alike with nearly seven thousand visiting Vinicombe Street on 26th November. Our twenty-foot Christmas tree was switched on by the adorable Bella from Beatson Cancer Charity, our charity partners for the event. We had face painters, balloon modellers, carol singers. There were even reindeer in Ashton Lane! Our elves (aka the street team) were handing out Winter Promotions as part of a campaign to shop locally and keep all of our small businesses thriving. If you missed this keep your eyes peeled for our Spring edition coming soon!